Phyllis Eisenstein’s award-winning 1978 Born to Exile takes us to a secondary world not unlike Medieval Europe, at least as perceived from the US. It’s a world with all the dangers and prejudices of old Europe minus (as far I can tell) anything like the Church. It is a region divided into pocket feudalisms, without any grand unifying authority. Although someone is working on that last detail…. It’s also a world with magic or at least something that will do until genuine magic comes along. Alaric the Minstrel has a fine voice but he also has a special talent, a talent so very special that if any of the people listening to him sing had the faintest inkling he had such an odd talent, they would build a special commemorative bonfire with Alaric as the centerpiece. Eisenstein is probably better known for her Alaric the Minstrel stories, if only because that’s still an on-going series; the most recent Alaric story, “Caravan to Nowhere” appeared in 2014’s Rogues. 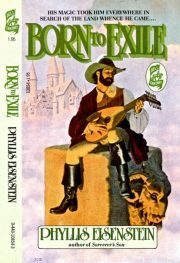 As it happens, Eisenstein is one of those authors for whom I discover in retrospect I am a completist, so I could have reviewed Born to Exile, the first Alaric fix-in. 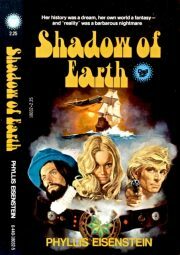 Instead I decided to go with the considerably more obscure Shadow of Earth, a tale of a modern American woman who finds herself trapped in a backward world where her only value is as a brood mare of rare breed: a full-blooded white woman! Some aspects of this novel have aged more gracefully than other elements.